Whether you're in a pickup truck or cruising around Canton in a hardtop convertible like the 2019 Mazda MX-5 Miata, performance is a feature that carries a lot of weight. The thrill of driving is enhanced when your vehicle performs how and when you want it to. The 2019 Mazda MX-5 Miata includes features to ensure just that. Once you arrive at Kempthorn Motors, you'll discover all that the 2019 Mazda MX-5 Miata has to offer. It starts with an improved SKYACTIV G 2.0L engine that is capable of 181 HP and that has an increased redline of 7500 RPMs. Coupled with a manual 6-speed transmission, you'll be in control of an effortless, smooth ride at all times. The 2019 Mazda MX-5 Miata also lightens things up. 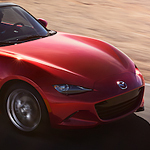 With lightweight rear wheel drive implemented to near 50/50 perfect weight balance and a SKYACTIV crafted chassis that increases stability, the Miata provides drivers with a richer connection with the vehicle and an overall more responsive driving experience.